What you get with registration! (1) shirt, (1) race bib and a water gun or pin wheel. The running, pushing, strolling, walking and posing starts at 8:00 am so please plan to arrive at least 45 minutes early in order to check-in (please bring your confirmation email, but don't stress, we will have a VIP guest list) and get your race bib, shirt and special gift for your passenger. We realize this is early and anything can happen with kids so we will have the race course start open for 30 minutes for anyone who ends up having a "bad morning". Please also keep in mind that it may rain on Saturday so dress yourselves and your children appropriately. Paid parking at the Zoo, managed by Washington Park starts at 9:30. You can "pre-pay" so that you don't have to go back to your car. You simply need to take note of your space number and then pay at any parking meter in the park (there are several throughout the parking lot, as well as in front of the zoo). You can pay as soon as you get to the park, but it won't kick in until 9:30. For example, if you knew you were going to stay until 10 am but got to the park at 6 am, you would just need to purchase 30 minutes when you arrive at 6 am. You do not need to put the receipt in the car. The course will start at the entrance of The Oregon Zoo. Once started, participants will head into Washington Park for a mile before turning around at the Archery Range and heading back to the Zoo. Participants will circle through the Zoo with views of the animal exhibits and finish in the Concert Lawn. We will have two water/snack stops along the way so don't stress if you or the kiddos get "hangry" or "thirstgry"? We realize that many of you will want to run side by side but please do not take up the entire area. Once we show the city and the Zoo how great we are, we hope to be approved for a larger roadway. We are so excited to have our amazing food vendors at the Mom Expo! They will be serving local delicious food that everyone in the family will be sure to enjoy. Verde Cocina -- Dishes are simple, healthy, unique, often rustic and always delicious. Pip’s Donuts -- World famous fresh, hot mini-doughnuts & fragrant house-made chai. CS Fisheries -- A boat to plate community enterprise providing local sustainable fish and seafood. Hakuna Murata -- Serving Japanese, Filipino, American food. Fun, fresh, fast & fabulous! Ben and Jerry’s -- We make the best possible ice cream in the nicest way possible. Ruby Jewel Ice Cream -- Everyone has a calling. Ours happens to be ice cream. 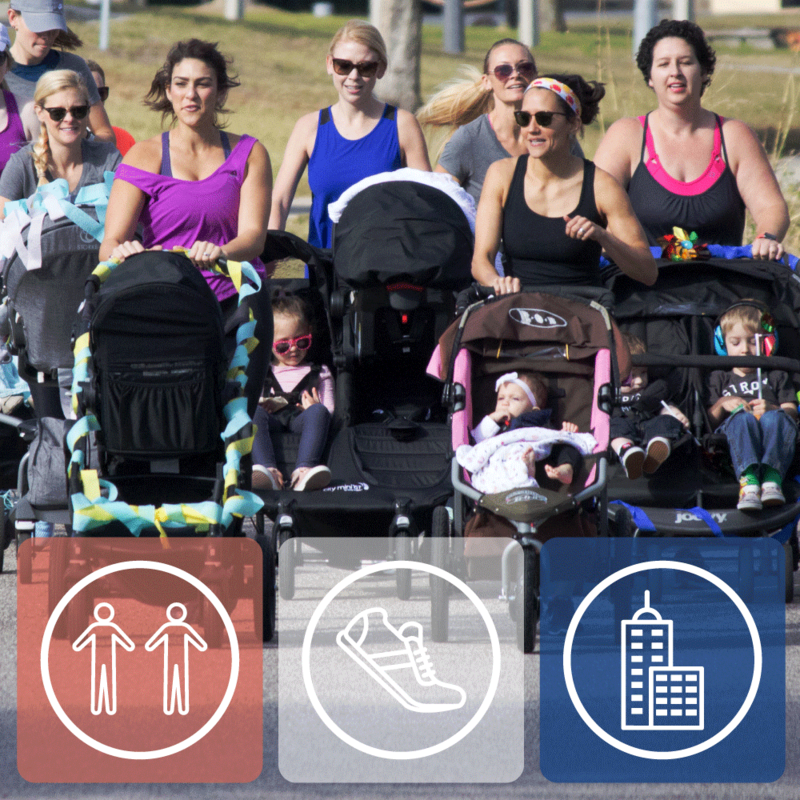 After the "race', check your stroller in at the Valet, drop the kiddo(s) off at the Kid Camp (must be registered online) and check out the Mom Expo or just hang out for some much needed "Me" time. The expo and kids camp will run from 9:00 am to 11:00 pm. Post-race Cool Down Flow at 9am. We are overwhelmed with the positive response for this first year event. So many Moms (and Dads) have told us their stories and how this event is a springboard to them getting out and getting fit. Not only that but we are helping Portland's Children's Cancer Assocaition at the same time! Not bad!